(1) Cast rolling -cold rolling trimming -cold rolling -box rolling slitting- finished product annealing -packaging. (2) Ingot -homogenization annealing -hot rolling -cold rolling- trimming cold rolling -box rolling slitting -finished product annealing -packaging. Aluminum foil can be divided into industrial aluminum foil and packaging aluminum foil. The chemical composition of industrial aluminium foil is relatively pure, and its thickness is 0.005-0.2 mm. It is mainly used as capacitors, insulation materials and moisture-proof materials in electrical and electronic industries. The thickness of packing aluminium foil is generally 0.007-0.1 mm. There are many kinds of products, such as flat foil, printing foil, colored printing foil and laminated foil. They are mainly used as packaging materials for food, tea, cigarettes, etc. The smaller thickness and width of aluminium foil produced by belt production method can reach 0.0025 mm and 1800 mm respectively. Aluminum foil rolling is seamless rolling, and the rolls are always in the state of elastic flattening. During rolling, the thickness of alu foil can be controlled by adjusting rolling force, rolling speed and tension. In rough rolling, the thickness ofalu foil is controlled by rolling force; in finishing rolling, the alu foil thickness decreases with the increase of rolling speed; the greater the tension, the smaller the thickness; in order to prevent fragmentation, the tension is usually chosen as 0.2-0.4 of standard yield strength_0.2 of foil. In low-speed rolling, the “thick oil-a00 aluminium plate rdquo” is often added to lubricating oil, or “thin oil” is used to adjust the rolling thickness of aluminium foil. Lubricant and roll condition have a very important influence on aluminium sheet foil quality. Aluminum foil billet comes from cold rolled aluminium coil. It is generally pre-annealed at 340-480 C, and its thickness is 0.4-0.7mm. The pass deformation rate is about 50% and the total deformation rate is over 95%. The foil whose finished thickness is less than 0.01-0.02 mm should be rolled and rolled in double sheets. 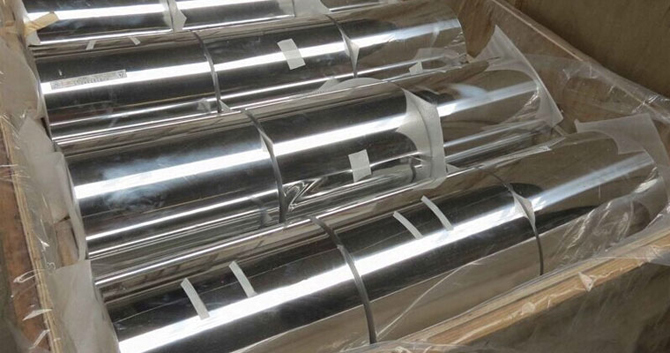 Tagged aluminium foil for air conditioning, industrial aluminum foil. Bookmark the permalink.